Stationed in front of Union Market, student activists put on a demonstration, rallying against the recent changes to the Ontario Student Assistance Program and the legitimacy of the McMaster Students Union. 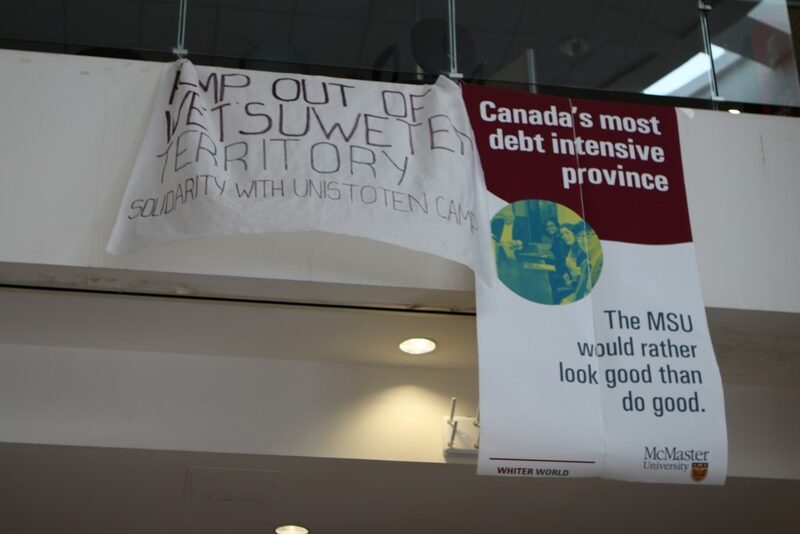 At around 1:30 p.m. on Jan. 30, protestors gathered in the McMaster University Student Centre. Their protest began on the north side of the first floor of MUSC and then moved to the MSU office. 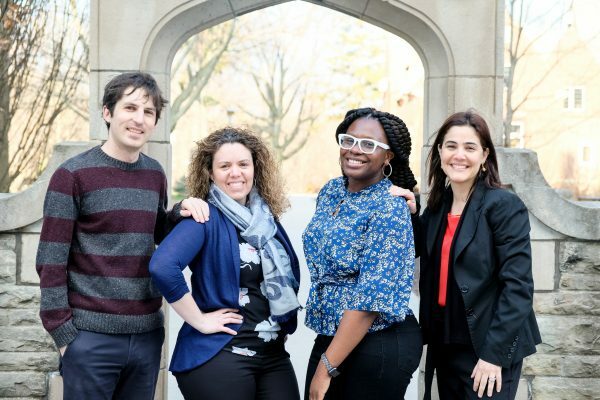 The group identifies themselves as the Hamilton Student Mobilization Network. HSMN is also the group running the rally against the OSAP cuts occurring on Feb. 1 in Gore Park. In addition to their speech, protestors handed out flyers promoting their Friday protest. In front of UM, the protestors also questioned the priorities of the student union. “The MSU alleges that it is an advocacy body. But our access to education has been treated as a bureaucratic jungle gym for aspiring government officials to play on — from photo-ops with Doug Ford, to convoluted statements, to superficial consultations, the MSU would rather maintain their image than meaningfully address student issues,” said one protestor. The protestors also spoke out against the MSU’s ability to maintain democracy. In particular, they focused on the MSU’s lack of movement on multiple motions passed at yearly General Assemblies. The GA is considered the highest form of democracy in the union and its motions, when the GA meet quorum, are considered binding on the MSU. Quorum, for an MSU GA, means three per cent of the union’s membership was in attendance. Protestors pointed to the MSU’s failure to apply boycott, disinvestment and sanctions against Israel, following a March 2015 ruling at the GA, a meeting which met quorum. They also brought up the continued employment of McMaster head of security and services Glenn DeCaire. During the 2016 GA, students voted in favour of a motion tasking the MSU to lobby for his removal. Following a demonstration in front of UM, protestors moved to the second floor and continued their protest in the MSU office. While there, they alleged that Michael Wooder, MSU director of marketing and communications, and John McGowan, MSU general manager, exert undue influence on the direction of the student union. At this time, the MSU has not responded to these allegations. 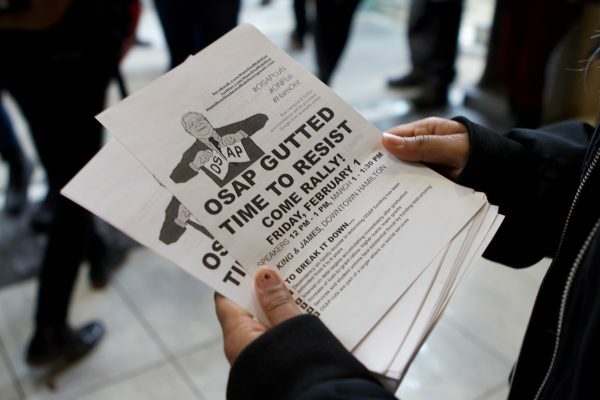 UPDATE: Jan. 30, 3:52 p.m.
MSU president Ikram Farah offered a statement in response to the protest, stating her continued work to challenge the OSAP cuts. UPDATE: Jan. 30, 4:01 p.m. 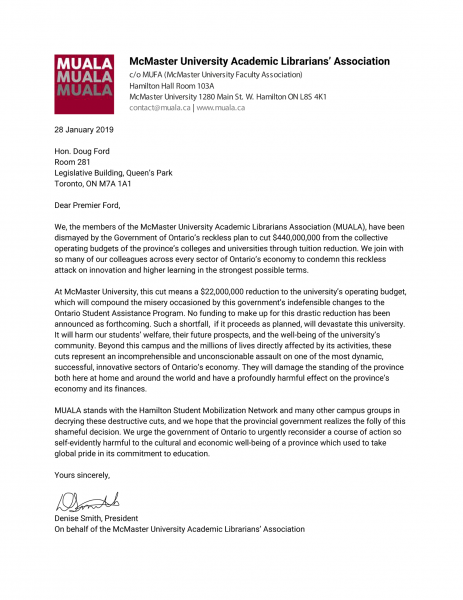 The McMaster University Academic Librarians’ Association released addressed to Premier Doug Ford against the OSAP cuts and in solidarity with the HSMN.